Guards! Guards! is the 8th Discworld novel by Terry Pratchett. 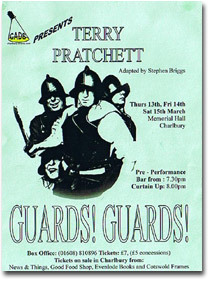 Adapted to a stage play for the amateur stage scripted by Stephen Briggs (1993). 36 Photos. Click thumbnail images to enlarge.